Hakan Samuelsson: "We have never had such a strong product lineup. Now it is time to perform and to grow." 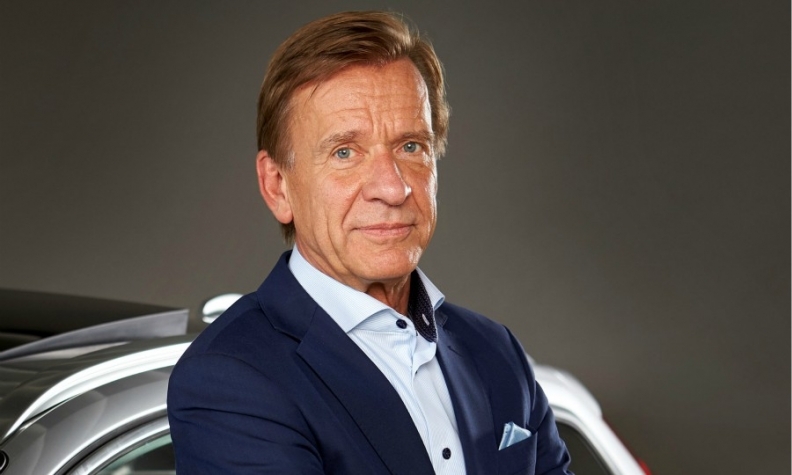 Volvo CEO Hakan Samuelsson expects the Swedish brand to capitalize on what he calls the strongest product lineup in the company's history. Samuelsson foresees another year of strong growth. He also outlined ambitious targets for the automaker's growing lineup of plug-in hybrids and for its new Care by Volvo subscription scheme. Samuelsson shared these goals and more during interviews with Automotive News Europe this year. We have never had such a strong product lineup. Now it is time to perform and to grow. This year will be another year of strong growth and improved profit. Volvo sold more than 570,000 vehicles globally last year. Will you top 600,000 for the first time in the company's history this year? We should continue growing at the pace we have been [between 2015 and 2017 the company increased sales between 6 percent and 8 percent]. We had some restrictions on the supply side over the last couple of years and now that is improving as we will have additional production capacity. And with our new plants in South Carolina, and Chengdu, China, we should have capacity to continue to have strong growth this year. What is happening to your diesel share in Europe? It is going down. That is the trend. Are your plug-in hybrids benefiting? Yes. Plug-in hybrids account for about 15 percent of the sales of models where the technology is offered [models in Volvo's 90- and 60-series model lines]. When will your 48-volt mild hybrids start to arrive? That will happen in 2019. What do you think will be the powertrain of choice in the future? We are slowly but gradually increasing our gasoline engine offer because we strongly believe in gasoline engines with electrification. We are expanding our range with the T6 plug-in hybrid with less horsepower [than the top of the line T8 plug-in hybrid]. A T5 will come in the XC40 with electrification. That is what we are looking at because in the long run we believe the dominant powertrain will be a gasoline engine with electrification. I think by 2025 that 25 percent of our global sales should be plug-in hybrids. What would you do in response to potential U.S. tariffs? Would you add more local production at your U.S. plant in South Carolina? The big question is whether there will be tariffs. If they come then we have to look into that. Right now, our plan is to build our S60 midsize sedan there. It is definitely a car for the U.S. The second car will be a big SUV, the next generation of the XC90, which is also a car for the U.S.
What percentage of your parts at the U.S. plant will be sourced locally? We estimate that 45 percent of our content will be sourced from North America at the start of production. What are your expectations for the S60 given that sedan sales are falling in the United States? It has to be targeted at a younger, more dynamic audience. I think our [mid-level] R-Design trim line will be very popular in the S60. That is what we are planning. If you look at the customer base, it is much younger for smaller sedans. It's a really big difference. I think you should expect that with big sedans the customers would be more geared toward our [top-level] Inscription line, which offers a bit more luxury, but I believe the S60 buyers will want something more dynamic. Will the S60 be added to the Care by Volvo subscription scheme? Yes, that will be the third car line that we will have with our subscription service after the XC40 and V60. MAIN CHALLENGE: Increasing plug-in hybrid sales to 25% of Volvo's global volume from 15%. How many people have taken advantage of your Care by Volvo subscription scheme and what is the goal? The interest from customers is very high. The inflow is good but it is too early to provide any numbers. That being said, we didn't develop Care by Volvo to achieve a 2 percent share. This has to be a really competitive offer for the customers and for us it should provide a more cost-effective way of distribution. Care by Volvo should account for at least a quarter of our sales within five years otherwise it would be a waste of time. How much is China driving the decisions you make at Volvo? China is a big and important market. When it comes to our bigger sedans, the rear seat comfort that we have introduced into our models was something new for us. That came from the influence of China. In the past, we didn't have too many owners sitting in the back seat being driven by chauffeur. That is something we learned in China. Given that China was our largest-single market last year (with 114,410 vehicles sold), we are listening more and more to the Chinese customers, especially when it comes to sedans. The power of the Chinese consumers has definitely increased. A good example is the tissue box in the XC40, right? Yes, that was influenced by the Chinese. They love their tissue boxes and we are the first one to have it integrated. Normally the tissue box is on the dashboard and it ends up flying around the car. Volvo owner Li Shufu is now the biggest single shareholder in Daimler. Do you see that resulting in collaboration between Volvo and Daimler's Mercedes-Benz? We are open for collaboration with everybody. If there is something we believe we can do together with another supplier or another automaker we will consider it. That has always been the case. If there is something we would like to do with another company, it has to make sense for us and for them. Are you concerned when rivals such as Daimler warn that their profits could take a hit from big investments in autonomous and electric cars? It is important to know how to prioritize. You cannot do everything. You cannot invest money in even more advanced diesel engines and even more advanced gasoline engines. You have to say: "No, that money needs to go toward electrification." Volvo won its first European Car of the Year award in 2018. The company has been seeing new records each year for vehicle sales and profits. How do you keep the momentum going? It has to do a lot with the energy within the organization. We are fortunate to be in the middle of a good phase. Things are going well. It is easier for people to be motivated and to give even more energy when you are successful. We just have to keep on moving. For example, we have been developing two cars a year. That was a capability that we had to learn and build up. That is something valuable as we move forward. Bringing out new products never goes out of fashion. Products will continue to make a difference. We have to continue to launch products that make a difference. We have to get our SPA2 architecture ready. We have work to do on electrification. You need to have a long list of exciting new cars coming. It reminds me of a good quote I saw from Albert Einstein, who said, "Life is like riding a bike. You have to maintain momentum or you will fall over." I like that. We have to keep on moving. If we stop we will definitely lose momentum, energy and motivation. How long will it take for Volvo's Polestar brand to be profitable? It will take some years. Until then, they will help us with the development of electrification. We will use the technology that they develop in our electric cars.